Fought over a three-day period July 1-3, 1863, the Battle of Gettysburg was the conclusion of Confederate General Robert E. Lee’s second invasion of the North during the Civil War. On the first day, Confederate forces pressed the Union Army of the Potomac, under General George G. Meade, through the streets of the small Pennsylvania town to a fish hook-shaped defensive line on high ground to the south. The Union line was anchored on Cemetery Hill and Culp’s Hill to the north and west, continued along Cemetery Ridge, and terminated at Little Round Top in the south. On July 2, Lee attacked Meade’s left, and fighting raged in the Peach Orchard, the Wheatfield, and Devil’s Den. Union troops won the race to the summit of Little Round Top and fought off several Confederate attempts to capture the hill. On July 3, Lee ordered the divisions of Generals George Pickett, Isaac Trimble, and J. Johnston Pettigrew to assault the Union center along Cemetery Ridge. The epic attack, known as Pickett’s Charge, was repulsed, and Lee was compelled to withdraw into Virginia. 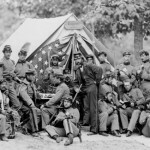 Losses on each side in killed, wounded, and captured topped 23,000, the greatest of the entire Civil War. The pivotal Battle of Gettysburg has been called the Confederate High Tide because Lee never again possessed the strength to mount a major invasion of the North. On November 19, 1863, at the dedication of the cemetery where many of the Union dead from the battle were buried, President Abraham Lincoln delivered the stirring Gettysburg Address.